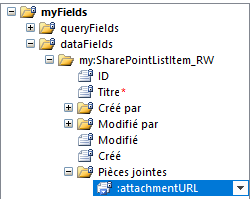 How to use the default attachment in infopath 2013? "Champ 2" is the new attachment, and it's not like the other. My question is : how can I create several attachments objects like the first one, with the same actions ? Browse other questions tagged attachments or ask your own question. How do I display a jpeg attachment as an image rather than as a link on an InfoPath form? How to add a calculated column which shows the modified date/time of an attachment?